I was drawn to Crewel because of its blurb that promised a non-conformist who was hiding her true abilities despite societal pressure. I was interested to see what would happen to this girl who went against the grain. I requested Crewel through a BEA-related promotion from Macmillan. This review is based off of that eARC copy. The Premise: In the world of Arras, some women are born with the ability to manipulate the fabric of existence. They are called Spinsters, and they keep the world running smoothly. They can weave food into being and thread supplies from one end of Arras to the other. But Spinsters are rare and under strict control of the Guild. Every sixteen year old girl is tested for ability, and if she qualifies, she’s whisked away by the Guild to a presumably glamorous life. She will never be seen by her family again, except as a glitzy picture on the occasional Bulletin. While most, including Adelice’s sister, Amie, believe being a Spinster is a dream come true, Adelice would much rather stay in Romen. For years under her parents’ guidance, Adelice has practiced her clumsiness. Although she doesn’t fully understand why her parents want to protect her from them, she assumes that the Guild’s tight control on society (where segregation, rationing, and marriage laws are the norm), is reason enough. As Adelice’s family begins celebrating her failure of the Spinster testing, they are unaware that Adelice slipped up and didn’t actually come off as a dud. Adelice hopes to have one last happy moment with them before being taken away. Unfortunately she underestimates her parents’ resistance. When the Guild comes knocking, her mother and father make a last ditch effort, but Adelice’s silence has limited their chances, and ultimately she’s dragged away, leaving behind at least one dead parent. My Thoughts: I have to hand it to this author — she knows how to get a story started. Crewel quickly sets the stage: a dystopian world held in the iron grip of the Guild. Every aspect of life is regulated, all because the Guild controls the Spinsters, and as her parents tell her “no matter how good their intentions, with absolute power comes corruption”. It’s a foreboding stage, and it makes sense that Adelice would want to avoid the Guild’s notice. Instead she screws up in testing and reveals her ability, which leads the Guild to violently rip Adelice’s family apart. They use force to yank Adelice from her home, and threats to make her smile and wave at the cameras, while Guild celebrity Cormac Patton smiles at her side. Later she is drugged, imprisoned, and rebound to the Western Compound for Spinster training. There she sees first hand what absolute power really brings. The concept of weaving the threads of life and existence is something I hadn’t seen before. Through manipulation of ‘threads’ on a special loom, Spinsters maintain the infrastructure of Arras, create food, transport people, and even bring new life to the world. But other manipulations are less benevolent. Spinsters are also able to change memories, make dissenting citizens disappear (literally), and remove the elderly even if they are not infirm. A dystopia based off of this concept of an ultimate control of existence is a brilliant idea. I found it interesting that women were singled out for particular control, even the female Spinsters. They were made to keep traditional female roles (teacher, secretary), not allowed to travel alone (unlike men). Even appearance (cosmetics) is regulated. It is easy to see where the Guild uses the “good of Arras” to justify their actions, and how the propaganda machine and careful memory manipulations keeps the general population blissfully ignorant of the Guild’s actions. The idea behind of this dystopia appealed to me, but the story didn’t quite ‘wow’ me in its execution. Like I said, the story starts out really well. I loved the first chapter – we’re not only introduced to the concept of Spinsters and Adelice’s own precarious situation, but we’re also shown the dynamics of a close-knit family. Because this story is told in the first person from Adelice’s point of view, I felt like her parent’s protectiveness and their need for secrecy comes through very well, as did her sister’s innocent belief in the system. The writing here balanced world building with plot and character development. As the story continued, this balance wasn’t as well maintained. One of the biggest issues I had was the with character development. Maybe it’s because all the other characters aren’t her family, so there’s less personal connection from her point of view, but after she leaves home, the secondary characters don’t seem to have the same depth as her family did. In my mind they fall into two groups: bad guys and everyone else. The bad guys are the ones in charge with power over life and death, and they use this power in petty ways. They were the most one-note characters representing a totalitarian government. As for everyone else, they were defined by their reaction to those in power. There was not much to distinguish a character personality-wise – not much that I could really connect to. More often then not, I just felt like they were being used to propel the plot by explaining things to Adelice at opportune moments or to serve as examples of the Guild’s evil. The love interests had a little more personality, but still not enough. There’s the ambitious assistant with his own agenda and the quiet brooder with a painful past. Again I had trouble connecting to these relationships and had trouble caring about a romance with them. There was very little to make me believe in Adelice’s interest, and two options felt gratuitous (that dreaded love triangle, thankfully not so bad here). Finally, we have Adelice herself. After what happens to her family, she is surprisingly… resilient. Sure, she sheds a tear here and there, but it is minimal. She says she is sad but I had trouble buying it. I didn’t read ‘mourning’ when her behavior and her narration are no different from your typical teen fond of a little snark. I think that my not buying Adelice’s connection to the other characters made them feel even more flat and lackluster. As for Adelice’s strength as a main character – Adelice is supposedly rebellious but this didn’t make her seem very smart when who she is mouthing off to just killed at least one parent. Her attitude didn’t win points when we find out Adelice is given a pass for what she is. When it comes to doing something about her situation other than realizing who the bad guys are, she spends much of the book finding supporters who already hate the system (they don’t need convincing from her) and doing what she is told without really knowing what is going on. It is when other characters that tell her that her life is in danger that she finally does something proactive rather than reactive. Writing out my review I think I have figured out what was missing for me in Crewel. It was that I wasn’t feeling the emotional depth that I wanted to. It just didn’t come through the pages. The story relied heavily on exploring the Spinster dystopia concept and it was what propelled it forward. The characters and their motivations were adjusted to fit this instead of vice versa. As a result it felt like the plot bypasses internal development (like Adelice absorbing her situation on an emotional level or really connecting to the other characters), in favor of shining a light on the challenges of living in a dystopia. This story is more plot-driven, less character-driven and emotional. Overall: It was OK. The mix of fantasy and dystopia in the concept of Spinsters and their abilities made a lasting impression, but the rest didn’t really resonate. I read Crewel a month and a half ago and I had to reread it to write this review because the rest of the plot disappeared from my head like gossamer mind candy. I think many people will enjoy this and be more engaged than I was, depending on how they react to the dystopia driving the story. Without the character/emotional aspect I felt like I was left with predictable abuses of power as the plot, and so, this story and I? We do not mesh well. I’m not sure I’ll continue this series. Crewel is out October 16th in the US, October 18th in the UK. 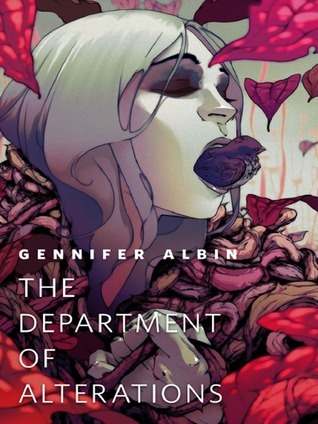 This entry was posted in book review and tagged dystopia, fantasy, futuristic, gennifer albin by janicu. Bookmark the permalink. Disappointing but not surprising. ; I find a lot of YA dystopias don’t go deep enough, especially with characterization. To be fair I think a lot of people will feel differently about this one. The writing isn’t bad and the premise was done well. I think I’m just really a character-driven sorta reader. This was more about the dystopia than anything else. Nicole just sent me a copy of this (like the good YAcker she is) and I’m pretty intrigued. Your review has actually piqued my interest further, it’s brilliantly written! Even with the issues you’ve had I think I’ll be moving this up my TBR pile. Thanks! I’m glad the review didn’t dissuade you and you want to try it anyway! Hope you enjoy this one. You know, every reviewer I trust has reviewed this as sort of a “meh” book. I wasn’t interested in it at all but then all of these elements contained in the story were things I thought sounded absolutely amazing. I want to see fury in these characters and rebellion against this world they live in but from what I hear they all seem sort of weak in comparison to main characters in other dystopias. I am kind of disappointed because the idea behind this novel sounds rather fantastic, I don’t think I’ll be picking this one up anytime soon. Yeah, I don’t know, a lot of people liked this, and I understand why, just didn’t work for me. Maybe borrow this one if you aren’t sure. I have to admit, I love the cover for that short story–it’s totally creepy! I think all of your points on this one are 100% valid, in fact, they’re the same weaknesses I saw (largely not connecting with those Adelice was supposedly connecting to), I think they just bothered me less. For me, I have a feeling this book was just good timing for me, it’d been so long since I’d read any dystopian that the familiarities didn’t grate on me. Great review, Janice! Yeah the short story cover is weird and wonderful. Like are those vines/branches or intestines? Is that a bird in her mouth? Creepy. Yeah, this one may not be your style. Thanks for saying that! This one had some elements I did like, but I really wanted to connect to the characters. Which is better than some dystopias where I haven’t liked either the world building OR the characters. Anyway, I want to be wowed more than I have been with this subgenre. It will happen – I didn’t think I’d like a YA & angels book until Angelfall. Ha ha, I’ve seen this cover lots of times but I only just now realised that there’s a girl’s face on it! I thought it was a flower or something, or just didn’t notice it at all. It’s a very different cover. Very pretty, I think it looks different from everything else, which is good. If you are undecided, yeah, wait for the paperback to give it a try.